Thanks to Charles Shultz having creating Snoopy's long-running battle with The Red Baron, there is likely no one who does not know what the Fokker Triplane is, even if they know absolutely nothing else about World War I aviation or airplanes in general. Famous more for the pilots who flew it than for any intrinsic qualities - the Sopwith Triplane, with ailerons on all three wings, was far more maneuverable - the Triplane was slower than its competition, and missed its "time slot" to demonstrate clear superiority over the enemy due to Fokker once again allowing shoddy workmanship in the factory to undo the aerodynamic advances of the design. The only airplane produced by Fokker that did not suffer from this was the D.VII, and even then most pilots believed the OAW license-build D.VII was superior to that which came from the Fokker factory. Contrary to popular belief, the Triplane was already in the drawing stage at the time Idflieg - the Headquarters of the Military Aviation Corps - came down with "triplane fever" in the late spring of 1917 after the successful introduction of the Sopwith Triplane by the R.N.A.S. Of the many triplanes created by various German aircraft companies, the Fokker triplane was the first out, and definitely the best. Appearing in June 1917, two F.1 prototype machines, 102/17 and 103/17, were sent to Manfred von Richtofen's Jagdgeschwader 1 in early August 1917. Of these, Richtofen flew 102/17 until he was wounded and shot down in his Albatros D.V later that month; the airplane was then flown by others in the unit, and was shot down on September 13, 1917 with Ltn. Kurt Wolf at the conrols. F.1 103/17 would become famous as the mount of ace Werner Voss, C.O. of Jasta 10, who scored the last 9 of his total 47 victories in this airplane before falling in an epic dogfight against seven S.E.5a's of 56 Squadron - all flown by top aces - on September 23, 1917. Ordered into production as the Dr.I (Dreidecker - Triplane) on July 14, 1917, the first Triplanes arrived on the Western Front that September. By October, the airplanes were all grounded, due to unexplained fatal crashes that involved wing failure. Examination revealed shoddy workmanship in the wings, with the glue failing to bond and water getting into the wooden structure. The airplane was grounded until late December 1917, while Fokker strove to replace the wings with items that were up to par. In the hands of good pilots, the Triplane was a formidable opponent in the early months of 1918. However, its lack of speed meant it could not initiate or break off combat at will,and the ever-growing Allied formations of Sopwith Camels, S.E.5a's and S.P.A.D. XIII's overwhelmed the airplane. It was essentially obsolete by May 1918; following the introduction of the D.VII that May and June, most Triplanes were discarded, with only Leutnants Josef Jacobs and August Raben continuing to fly the airplane and score with it - an indication more of their ability than anything intrinsic in the design. The loss of Manfred von Richtofen - the ace of aces of the First World War - in a Dr.I on April 21, 1918, gave the airplane a patina of epic myth that has kept it in the public mind long after many better aircraft have been forgotten. 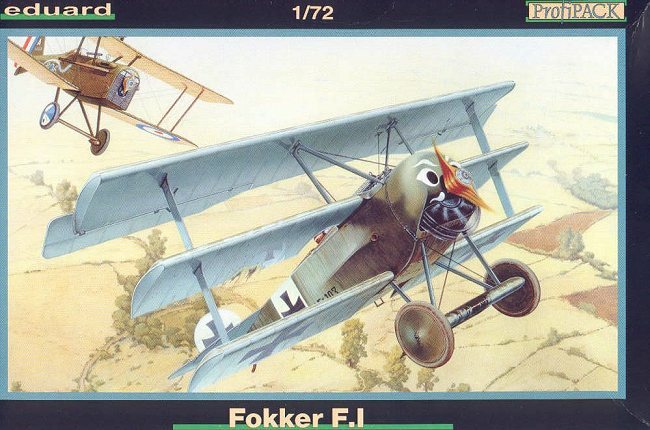 There have been several Fokker Triplanes released in 1/72 scale, with the earliest being one by Airfix in the late 1950s, followed by another from Revell in the mid-1960s, both of which have been re-released numerous times over the years. Unfortunately, both suffered from problems of accuracy. Recently Hawkeye Designs released a resin kit of the airplane which is considered accurate on all counts by Those Who Know These Things among the WW1 modeling fraternity. This Triplane is Eduard's second foray into the field of 1/72 models, following their excellent Albatros D.Va that was released this past Spring. At present, the kit is released in two versions, a "standard" kit without photo-etch detail, as the Dr.I 152/17, one of several triplanes flown by Manfred von Richtofen, and one as the F.1 prototype, in a Profi-pack release that provides the photo-etch detail set; this can be done as von Richtofen's 102/17 or Voss' 103/17, with the famous "face" on the cowling. 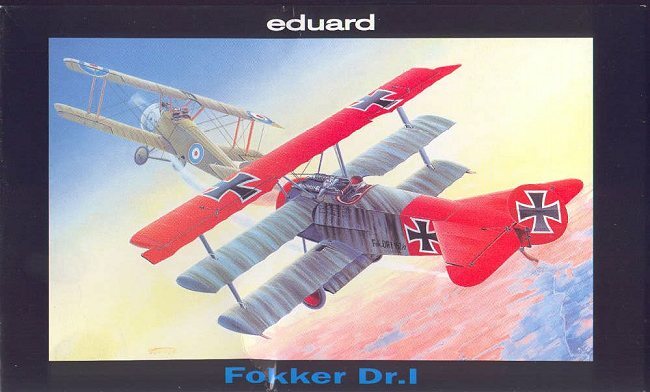 From the boxart, it is apparent that Eduard comes down with those WW1 researchers who do not believe Voss' airplane had a yellow cowling, as it is shown with the factory-standard dark olive green finish. Company advertising shows that a Dr.I Profipack kit with markings for Ltn. Kempf's "Kennscht Mi Noch?" ("Remember Me?") will be released later this year. The kit comes on two sprues of light tan plastic, cleanly and crisply molded as we have come to expect from Eduard in the past four years. The surface detail is equivalent to that of the 1/48 DML release - without the incorrect fabric effect on the lower wing surfaces. On the "standard" kit, the cockpit interior detail consists of molded-on side panel detail, a seat, control stick and floor. This is quite adequate in this scale and better than is generally found in 1/72 WW1 kits. The photo-etch fret of the profipack version is very delicate, and will provide a cockpit that will be as detailed in 1/72 scale as the DML kit is in 1/48. WW1 modelers who choose to build in 1/72 scale have been well-served in the past few years with a number of new releases from various manufacturers. The Eduard Albatros D.Va has been called the best 1/72 WW1 model released yet. It looks like the Fokker Triplane is a worthy contender for that title. 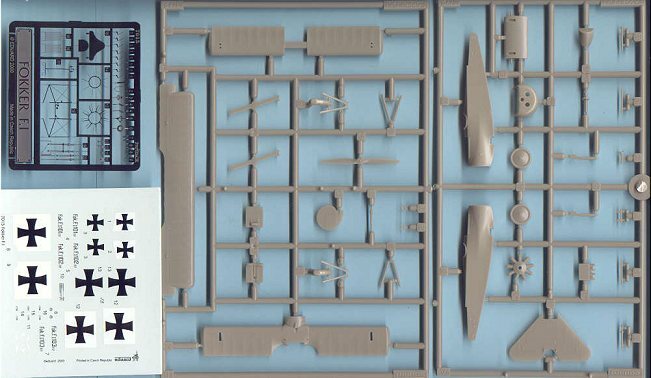 The Profipack kit is so nice that this dedicated 1/48 modeler will likely create his first 1/72 single engine airplane model in 20 years, using this kit. Thanks to Eduard for providing the review kits.